Ken Giannoules once guarded Kennedy. Ken Giannoules of Arlington Heights holding a photograph of himself working as a Secret Service agent, right, with Presidents John F. Kennedy and Dwight D. Eisenhower at the dedication of Dulles International Airport in 1962, taken by White House Photographer Abbie Rowe. For Secret Service Agent Ken Giannoules, his overnight shift guarding President Kennedy in Fort Worth, Texas, extended into the morning of Nov. 22, 1963. As JFK departed for Dallas, Giannoules flew to Austin, where he prepared to guard the president again that night. “One night we were with President Kennedy, and the next night we were with President Johnson,” remembers Giannoules, 71, who retired from the Secret Service in 1981 and now lives in Arlington Heights. The agent was about to go to sleep that afternoon, in preparation for working another shift that started at midnight, when news broke that President Kennedy had been assassinated. Giannoules and the other agents in Kennedy's overnight guard flew back to Washington, D.C., on a military plane, and were working for Lyndon Baines Johnson just hours after the new president took the oath of office. A quiet, modest man who has to be coaxed into telling stories about his years in the White House, Giannoules says he's only talking about his experiences now because his friend and former co-worker Clint Hill is coming to the Wood Dale Public Library on Tuesday night to talk about his best-selling memoir, “Mrs. Kennedy and Me.” Hill was the agent who scrambled onto the back of the presidential limousine convertible after the first shot hit the president. Hill corralled the first lady, dragged her into the back seat and covered her and the mortally wounded president with his body. In a memorable “60 Minutes” interview in 1975, Hill, who clamored into the car in less than two seconds, blamed himself for not being quicker. All the men in charge of the president's safety felt Hill's pain. He and his fellow agents on the midnight-to-8 a.m. shift that day didn't feel guilt, but they still wondered if they could have prevented the tragedy, Giannoules says. “If we had been there, maybe we would have seen something, maybe we could have done something,” he says. As a nation mourned, Giannoules and the other agents worked. While Giannoules said the relationship was always professional, President Kennedy called Giannoules by his first name, met his Greek immigrant parents (Steve and Eleftheria) during a visit to Chicago and laughed when the father asked about his son's job performance. “From then on, whenever the president would see me on post, he'd say, ‘Ken, tell Steve you are doing a good job,'” Giannoules says. The days after JFK's assassination are still a blur to the former agent. A photograph of the Kennedy funeral shows Giannoules standing near French President Charles de Gaulle and Queen Frederika of Greece on the steps of St. Matthew's Cathedral, hours after his night shift should have ended. He says he repressed the memory of standing with other agents around JFK's flag-draped casket in the White House the day after the shooting until he read his name in a passage about that moment in “The Kennedy Detail,” another recent book written by fellow agent and friend, Gerald Blaine. “It was just us in the East Room,” Giannoules says, recalling that private moment for staff members before the president's body was moved to lie in state in the Capitol rotunda. The agents continued working for the new president. He worked with several presidents and their families during his more than 20-year career with the Secret Service. He was an advance man in Greece, where he spoke the native language, setting up security for Jacqueline Kennedy when she vacationed after the death of her infant son, Patrick. 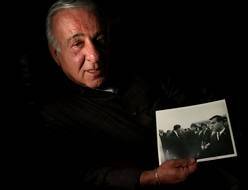 Giannoules was with President Kennedy at the hospital when the president's son died. His scrapbooks bring back memories of his first duty at the White House, when President Eisenhower entertained guests on the U.S.S. Sequoia Presidential Yacht while Giannoules followed on a Navy PT boat. Another memorable trip with Eisenhower was a golf outing to Augusta National Golf Club, home of the famed Masters golf tournament. He visited 52 countries and the Vatican. He provided security for the queen of England. He spent a tense night in Cambodia guarding Vice President Spiro Agnew. He was in the presence of big-time celebrities such as Bing Crosby and Frank Sinatra, and was next to the president in Madison Square Garden in 1962 when Marilyn Monroe crooned a sultry rendition of “Happy Birthday” to Kennedy. “I was in all those places, but I didn't see all those places,” Giannoules adds, noting that his focus on security kept him from sightseeing. He made $4,980 a year when he first started guarding presidents, and he had an expense allowance of $12 a day for hotel, food, laundry and other incidentals. Giannoules declines to comment on the current investigation into allegations Secret Service agents partied with prostitutes in Colombia, but he makes it clear that the agents he worked with a half-century ago were strait-laced and represented their nation well. He also says he never saw any presidents engage in untoward behavior. He was there to protect the office of the president. Eisenhower had the formal air of a statesman and war hero, while Kennedy was “a completely different personality” and made a point of learning every agent's name, the agent notes. “Johnson would only recognize you if you were from Texas,” Giannoules says. At a villa in Greece, Jacqueline Kennedy leaned out the window and called him by name. “I was astounded she knew my name,” remembers Giannoules, who spent several assignments with Jacqueline Kennedy. “The most touching thing was when I got this note from Mrs. Kennedy,” Giannoules says, showing a handwritten note addressed to him in January of 1964 and signed by the former first lady. “Thank you for all you did for the president,” it reads. After he left the White House detail, Giannoules served his country as chief of INTERPOL, the international police organization, before ending his Secret Service career in 1981 as the special agent in charge of the Secret Service's Chicago Field Office. A frequent lecturer and adviser on security issues, Giannoules then founded Aegis Services, a private security service whose clients included Oprah Winfrey. For safety, he keeps his mementos in a locked facility not at his home, including photographs showing him on guard for every president and former and future president from Harry Truman through George H.W. Bush. The books by Hill and Blaine have been “cathartic,” Giannoules says, admitting that it's made him share some stories with his family for the first time. Dianne, his wife since 1990, hasn't heard some of the stories he tells during this interview. “When I met him, he said he was a truck driver,” Dianne says, adding that she fell in love with the man, not his career. Now Ken Giannoules says he appreciates the history he saw firsthand and the people he got to meet. A job he says he's glad he did. Your story is very nice and informative keep it up.